Staff always very friendly and helpful. Loved staying here, really hated to leave. Property was nice and clean, condos inside are beautifully schemed, loved the colors, felt very inviting and relaxed. The team at Navarre Properties were excellent to work with, very friendly and helpful with any questions I had!! Thanks guys for helping to make our vacation a memorable one. We loved everything about it!! Everyone we came in contact with was super helpful. Jonathan at the Front Desk at Summerwind made us feel so welcome. Great smile, very kind, courteous and knowledgeable. Five star customer service. Everything was good except for sofa bed. The mattress needs to be changed out. Location is PERFECT! 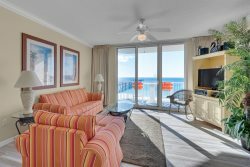 Beautiful gulf views and close to the pier!